Explore GoBig Printing's Suite of web-based tools designed to automate & manage seller leads from prospecting to retention! Find Motivated Sellers with our easy, map-based search. Filter up to 70 property types. Search for an individual property or for groups of properties with simple intuitive clicks. Supress records and real time CASS Certification. Customize from pre-written templates. Simply edit "on demand" and view a real time mail merge. Each Smart Template™ Auto-populates with your profile and your recipients info. Move the Variable Tokens around for total personalization! 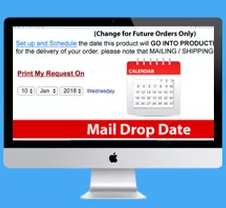 Schedule the date you want your direct mail to be in the mail stream. Choose different direct mail pieces and create future campaigns. Pay only when your campaign runs. You don't have to pay all at once. Edit "On Demand" - See it in action! Stop screwing up your leads! 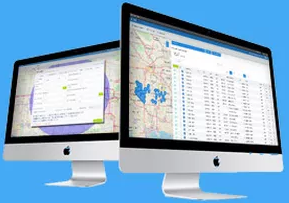 The first Podio lead automation system for Real Estate Investors. InvestorFuse is a lead management CRM designed to help investors close more deals through automation and time-saving technology. No technical ability or 3rd party integration's required. I have to tell you, you really have an impressive program. We were considering doing our direct mail locally but not only are your prices very competitive, you make it much easier to go through the whole process. Thanks so much! 24 PROPERTIES TO WHOLESALE SAYS IT ALL!!! THE GUYS AT GOBIG - GO ABOVE AND BEYOND EVERY TIME! Direct marketing is distinguished from other marketing efforts by its emphasis on trackable, measurable results. Add the ability of customization or personalization to a GoBig Document Fulfillment system and you have a solution that offers truly reader-centric, 1-to-1 communications between businesses and customers throughout the full spectrum of the customer relationship cycle. Empower your direct sales channels to use their contact lists and knowledge about the customers to personalize content while protecting your corporate branding. Push a few buttons and know your Direct Mail piece is being delivered to your customer as you read this. Accurate data processing is key to the success of today’s direct marketing efforts. We can help you keep your list organized, clean and up to date with all the postal regulations. We provide list hygiene, variable mapping, list updating, list acquisition and supplementing. Benefits of using Go Big Mail Services: We will sort your mail to provide you with the lowest postage available. Our mailing services include processing your list, duplication removal of names on your list, CASS certification, inkjet addressing, postal presorting and a daily pick up by the post office. Your cards are mailed from the same location they are printed in. • Faster post office turnaround. We barcode each address so that your mail goes through the Post Office’s automated system faster than regularly printed addresses. One of the biggest mistakes that we see people make regarding Direct mail marketing is to send out just a few mailings and then quit. It’s much more then Direct Mail. It’s Direct Mail Marketing. The Direct mail we send are called “campaigns.” It’s called a Campaign for a reason. It is very important to understand that your response rates will go up with subsequent and consistent mailings. (As well as valuable, relative and pertinent content) Some people will look at your mail piece for several months or a year before they call you. You want to be the one that is still mailing to these people when they finally become motivated. You want to be “Top of Mind.” Remember that time and circumstances change all things. This is especially true for absentee owners for Real Estate Investors. The study went on to say that 90% of the people gave up after the 3rd contact. If you want to be one of the 10% who stick it out and close 81% of the deals, you must have a system for doing this. Without some type of system, it will never get done. Direct mail effectiveness – It’s a good bet says the pros! 27% more of campaigns which delivered high sales performance included mail than did not. Campaigns with mail in the mix achieved over twice the market share growth as those without. 90% of “Millenials” believe direct mail is reliable and 87% like getting retail information/offers that way. Variable-data printing (VDP) (also known as variable-information printing (VIP) or VI) is a form of digital printing, including on-demand printing, in which elements such as text, graphics and images may be changed from one printed piece to the next, without stopping or slowing down the printing process and using information from a database or external file. For example, a set of personalized letters, each with the same basic layout, can be printed with a different name and address on each letter. Variable data printing is mainly used for direct marketing, customer relationship management, advertising, invoicing and applying addressing on self mailers, brochures or postcard campaigns. There is no limit to the number of Variable Data elements that can be assigned to any direct mail piece. A Real Estate Investor may want to do a direct mail campaign to an Absentee Owner. 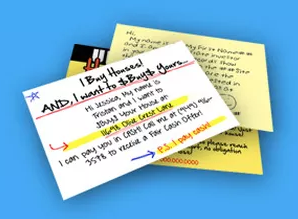 His list is comprised of many different fields such as “Owners” information including names & address AND the address of the “Site Property” & “Days behind in Mortgage.” We can insert all of these variables into the document, whether it’s a hand-written Yellow Letter, Postcard, or newsletter.